Vaporsens and the Utah Department of Environmental Quality to provide real time monitoring of air toxins in Davis County. SALT LAKE CITY, UT -- Vaporsens and the Utah Department of Environmental Quality, Division of Air Quality will team to deploy a distributed network of chemical sensors in the Bountiful area to provide real-time monitoring data of critical outdoor air toxins, such as formaldehyde. The 2-year project began March 1, 2018. The project is funded by a Community Scale Air Toxics Ambient Monitoring grant from the Environmental Protection Agency Region 8, aimed at utilizing emerging technology to improve air quality monitoring in communities. Current monitoring methods require air samples to be sent to a laboratory for analysis. After analysis, the laboratory provides a written report with pollution information. The delay in receiving pollution information can inhibit the decision-maker’s ability to proactively intervene or alert the public. The Vaporsens sensor network will offer continuous, real-time measurements of air toxins at a lower cost. The EPA sponsored grant will provide $330,765 in funding for this project. The objective of the grant is to evaluate emerging technology for improved community air quality monitoring. The 2-year project will include 24 hour continuous monitoring in three strategic locations in the Bountiful area. Bountiful was chosen because a previous study indicated elevated levels of toxins. “It is a pleasure to announce the collaboration between Vaporsens and the Utah Division of Air Quality (DAQ). Vaporsens’ innovations in real-time detection technology allow communities and citizens to live safer, healthier lives. We welcome the opportunity to collaborate with the committed team at the Division of Air Quality, and to provide technology that will benefit the people of Utah.” Angela Mitcham, director of partnerships, Vaporsens. Vaporsens is a privately held company and is the technology leader in nanofiber chemical sensors. The company provides scientific R&D services, and manufactures chemical sensors and sensor instruments for the detection of gas and vapor phase chemicals. 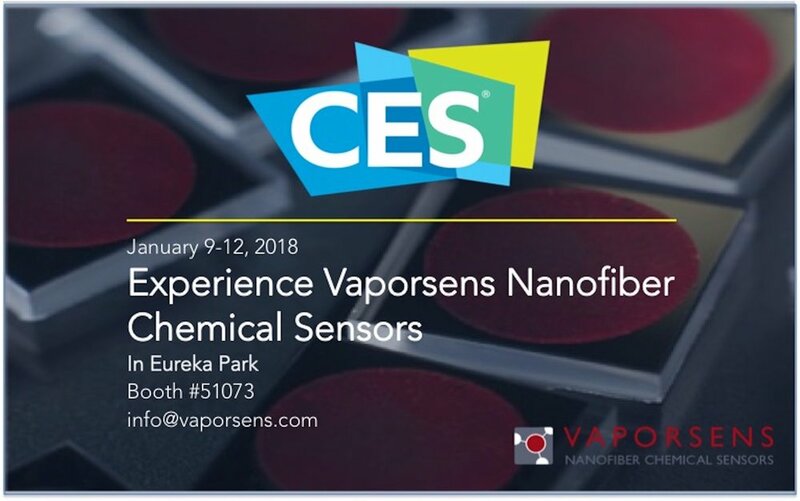 Visit Vaporsens at CES January 9-12, 2018! (Denver, Colo. – Sept. 19, 2017) Today, the U.S. Environmental Protection Agency announced $1.6 million in funding for small businesses to develop technologies that will help protect human health and the environment by detecting chemicals in the air, ensuring cleaner water, and creating greener materials. These companies are receiving Phase I contracts from EPA’s Small Business Innovation Research (SBIR) program, which awards contracts annually through a two-phase competition. Companies compete for a Phase I award of $100,000 by submitting research that addresses key environmental issues. After receiving a Phase I award, companies are eligible to compete for a Phase II award of $300,000 to further develop and commercialize the technology. Vaporsens, Inc. in Salt Lake City, Utah, was awarded the phase I contract for indoor formaldehyde detection by a low-cost chemical sensor based on organic nanofibers. Formaldehyde comes from a number of indoor sources and is carcinogenic. Vaporsens organic nanofibers have been developed for a number of applications, including detecting explosives, narcotics, toxic industrial chemicals, and chemical warfare agents. "Vaporsens is honored to receive this award from the Environmental Protection Agency,” said Doug Later, President/CEO, Vaporsens. “We are eager to continue developing nanofiber chemical sensor solutions for formaldehyde that will contribute to the safety and health of humans and the environment." Vaporsens is honored to be awarded a Phase I SBIR research grant from the Environmental Protection Agency. The research award will be used to continue the development of Vaporsens nanofiber chemical sensors for monitoring formaldehyde in indoor environments. Vaporsens is eager to develop sensors that will effectively mitigate the public health risk of pervasive formaldehyde exposure. Visit Vaporsens at Sensor Expo in San Jose, June 28-29! Visit us at Booth #1522. Email Angela at angela.mitcham@vaporsens.com to schedule a meeting. Vaporsens was honored to be selected as one of the top 40 University Start-Ups by the National Council of Entrepreneurial Tech Transfer. Vaporsens was able to participate in the NCET2 University Demo Day in April 2017. Smart Cities Connect brings together a global community of city leaders, technology and solution providers, investors and innovators who are working together on the next generation of Smart Cities solutions. The event will take place in Austin, TX, June 26-27, 2017. Vaporsens has been selected as a finalist in the TechConnect Innovation Showcase which highlights top industry vetted technologies in focus areas such as transportation, energy, sensor networks, data analytics and more. Vaporsens will be providing a talk on Monday, June 26th on the topic "Low Cost Distributed Sensor Networks for Air Quality Monitoring." We will also be providing demo's at the Expo Monday afternoon. Contact angela.mitcham@vaporsens.com to set up a meeting in Austin. We'd love to connect with you! Vaporsens is honored to be awarded one of eighteen spots in the IDTechEx Launchpad Competition! We were awarded a free exposition booth and will be providing a technical presentation at the Sensors Expo in Berlin, May 10-11. If you're interested in attending, Vaporsens can provide you with half price tickets. Email Angela at angela.mitcham@vaporsens.com for details.